The Minister for Health has put forward an amendment to the Regulation of Termination of Pregnancy Bill allowing a second practitioner to carry out an abortion procedure if the first practitioner is unavailable. The amendment relates to the three day wait period, which allows for 72 hours between a woman's first visit and the second visit. Speaking in the Dáíl, Simon Harris said his amendment recognises that a woman may not see the same practitioner on her return if, for example, the first practitioner is ill. The minister described it as "a sensible amendment" in order to address the practical realities and to avoid barriers for women seeking to access terminations. However, TDs voiced opposition to the move. Fianna Fáil's Billy Kelleher pointed out that the Eighth Amendment Oireachtas committee did not make a recommendation on this area. He claimed the three day wait period was inserted to allay the concerns of Tánaiste Simon Coveney. Labour TD Alan Kelly said he accepted the three day period was in the heads of the bill but if it remains, he said: "We need to look at when the woman makes the arrangement with the GP and when the clock begins". People Before Profit TD Brid Smith said she sees the waiting period as an obstacle, describing it as "cruel and highly political". She also noted that this did not form part of either the recommendations of the Citizens' Assembly or the Eighth Amendment Oireachtas committee. Solidarity-People Before Profit TD Ruth Coppinger said the period was about punishing women, and it should be reviewed if it becomes a major problem for them. Earlier, an amendment to the bill calling for public funds not to be used in abortion services was defeated. The motion put forward by anti-abortion TD Carol Nolan was defeated by 90 votes to nine. A number of amendments remain at the report stage, which is continuing tonight. Regarding the offences section which is located at the front of the bill, Minister Harris told the Dáil that following committee stage requests he would move the offences section to part three of the legislation. The offences section allows criminal sanctions for anyone found guilty of providing abortions outside of the act. Independents4Change TD Clare Daly described the provision as wide-ranging enough to have a chilling affect and broad enough to leave health providers open to malicious reports and criminal investigations regarding their decisions. Ms Daly said given that the Eighth Amendment was removed by popular vote, there was no requirement to have the clause in the legislation. The minister refused amendments proposed by the Opposition, including the entire deletion of the offences section from the act. He said he felt a responsibility to "stick to" what people voted for in the general scheme of the bill, which included the offences section. Mr Harris said that by avoiding illegal abortion, the offences section would eliminate health risks to women. An amendment by the minister reducing a review of the abortion legislation from five to three years has been accepted. The section will allow for an independent review of how the act is operating after three years. 11 TDs put forward an amendment calling for the review to include information and data around barriers women face in accessing the service or the number of women from Northern Ireland seeking to avail of it. Sinn Féin Deputy Louise O'Reilly said there was a need to be prescriptive about the recording of data, and proper records were required to ensure that the service had real and tangible meaning. Social Democrats co-leader Catherine Murphy said it would be important to leave a marker for future governments about reviewing the legislation. Mr Harris said that an Oireachtas health committee or the Dáil should agree terms of reference for a review and that it should be an external or independent process. Regarding data and statistics, he said a report would be laid before the house in relation to statistics and data on abortion on an annual basis. "I can demand any data from the HSE at any time", he said. 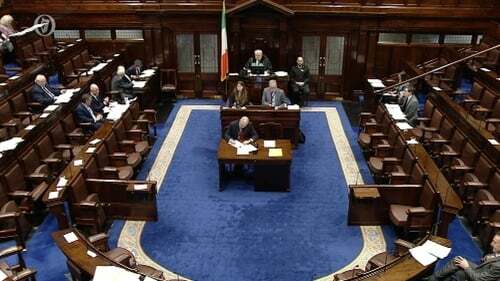 The amendment from the 11 TDs was defeated by 64 votes to 34. Discussion on the remaining amendments will continue tomorrow.